It’s very likely a stretch to suggest that chocolate & açai-covered blueberries might help clear some third-eye chakra congestion. However, the results of my recent research on this chakra, called Ajna, yielded such a wide variety of sometimes conflicting answers, that the berries might stand a chance. But then, perhaps on some days, you just need some chocolate-covered blueberries. Witness a body, mind or spirit need, fulfilled. During the winter holiday season, I want to give something back to the wonderful people who come to my yoga classes throughout the year. 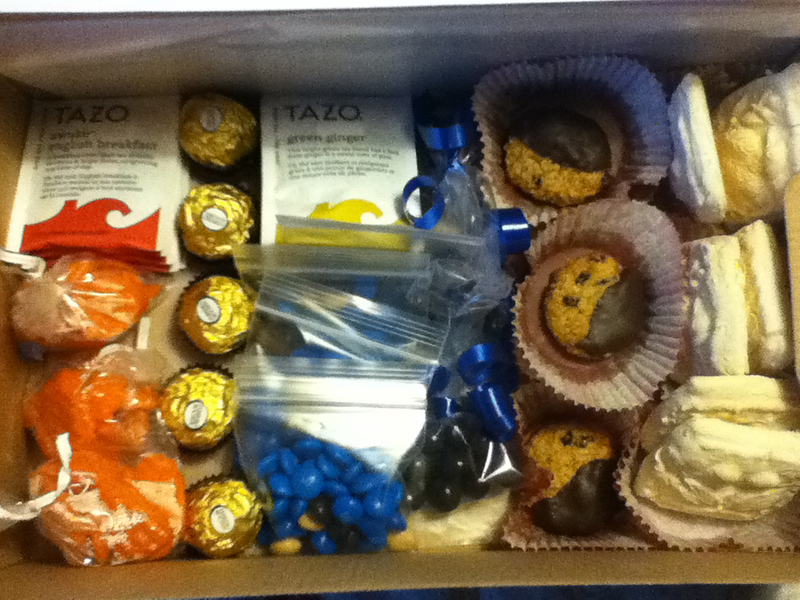 I’m also a creative person who likes to bake, so the gifts tend to be of the edible sort, linked somehow to yoga. Last year I was inspired by Ayurveda, so I made three types of fudges, with flavorings selected to help bring each of the doshas into balance: Lavender and mint to cool the fiery temperament of pitta-leaning people. Ginger and cinnamon, to stimulate anyone who is perhaps too grounded by their steady kapha disposition. And finally, a milky, soothing Irish cream (yes, white fudge with Bailey’s) for anyone driven in too many directions by their vata dosha. Here’s a quick primer on the doshas, if this vocabulary seems daunting. At first I thought I might do something similar this year, but then I realized that I hadn’t finished my series of chakra-focused yoga sequences. 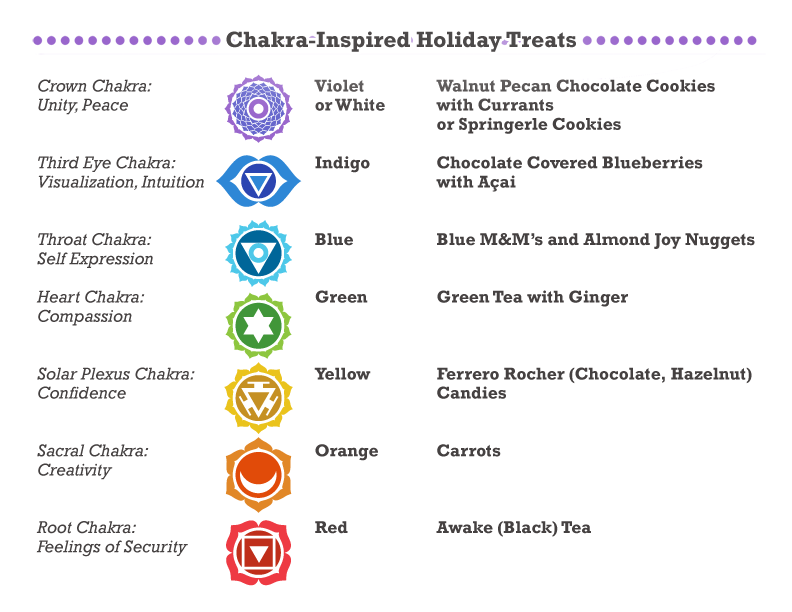 Thinking up some chakra-inspired treats might compel me to figure out how to do an Ajna-focused yoga class. And indeed, it did! Earlier this fall, I’d been taking my students on an adventure up through the energy centers/vortices of the body. In week one, we did a sequence focusing on the root chakra; I suggested a devotion, perhaps of gratitude for the people or things who give us feelings of security, then led them through a sequence using cues that brought their attention to their grounding, via strong feet and legs, or through a stable seat in seated postures. We had worked our way up through throat chakra around mid-November. It’s possible that we briefly stalled the progression in order to give special attention to a student’s need for extra twists or attention to hamstrings. However, I was a little stumped on how to design a class focused on Ajna, or the third-eye chakra, anyway. Most of the lower chakras mapped more easily with physiology: sacral chakra is hip-opening work, heart chakra is chest and shoulder work, we vocalized some rare aums for the throat chakra, etc. With the third eye, the only really obvious poses are ones in which your forehead connects with the ground. So, child’s and prone pigeon pose, and prone pigeon isn’t available to all of my students, anyway. I’d have to get a little more esoteric than I usually do in class, using some cues during balance and more restorative postures that touch upon realizing and cultivating the sixth-sense, or the intuition … allowing the mind to let you see more than what’s obvious to the five senses. It’s creative thinking, to a degree; or perhaps just the part of it that is letting go of what you see in front of you, in order to see something else that gives you real insight. So, that’s how the third-eye yoga classes went this week. I think they were a success. Perhaps they were; there were smiles at the end, and I had a new student this week who, upon realizing she came on day with goodies, remarked that she’d definitely picked the right day to join us. How did she pick it? Intuition? Ha. We’ll go with that. Onward, to crown chakra, next week. Back to the food part of this post: I ended up doing less baking, but more designing and shopping, than last year at this time. I had no idea it was so hard to find indigo-colored food! This discovery betrays some of the creative license I took with assigning foods to chakras. It’s just color-based; any pairings that might actually map well to clearing congestion in a certain chakra are purely coincidental. The two teas worked well because Tazo uses vibrant red or green packaging for those two flavors. About the colors: the seven chakras are assigned colors, which conveniently map to a rainbow of seven colors. While I love sweets, I wanted to be sensitive to anyone needing something other than sugar by the time they arrived at my class, so a few of the treats were teas or vegetable crudités. Almost everything else had chocolate in it, I now realize. The one exception: the wonderful springerle cookies, which I bought at the recently re-opened Jerabek’s New Bohemian Bakery. At the end of each of my classes this week, I invited students to take a peek into the box, which had the above chart attached to the inner lid, and choose what they wanted. For whatever reason. The blueberries disappeared faster than anything else. Ajna chakra win! Or perhaps just a dark chocolate win. At any rate: Happy holidays! My gift to you: the recipe for the Chocolate-Dipped Walnut and Currant Cookies, which I paired with the crown chakra, as they have violet-colored dried currants in them. They weren’t as popular as the blueberries at my yoga classes, but they are very good, according to everyone who has tried them (we’re working on the leftovers, right now). They are also gluten free: full of nutty goodness.